What do you serve at your Christmas dinner for dessert? For many, it’s pie; apple or pumpkin, similar to Thanksgiving. For some, it’s fruitcake. For a large chunk of time, for me, it was a Bailey’s Cheesecake. A more British Christmas tradition is to serve a pudding. Now, pudding is a misleading word to those of us who don’t live across the big pond. Pudding is basically the British word for dessert, so it could be anything. 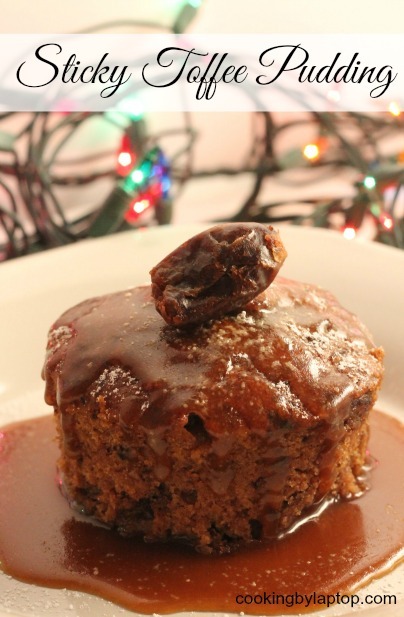 When it comes to Christmas, however, pudding is steeped in tradition. Normally, it’s made with plums or figs, and other dried fruits (all of which have symbolic significance), steamed, and then dried for months before being doused with brandy and lit on fire as the culmination of the Christmas feast. It’s less than two weeks until Christmas. Ain’t nobody got time for that. This dessert, however, could be an excellent stand-in. The cake is incredibly moist, partly due to its being cooked (ie partially steamed) in a bain-marie, and partly because it’s laced with sweet, moist dates. 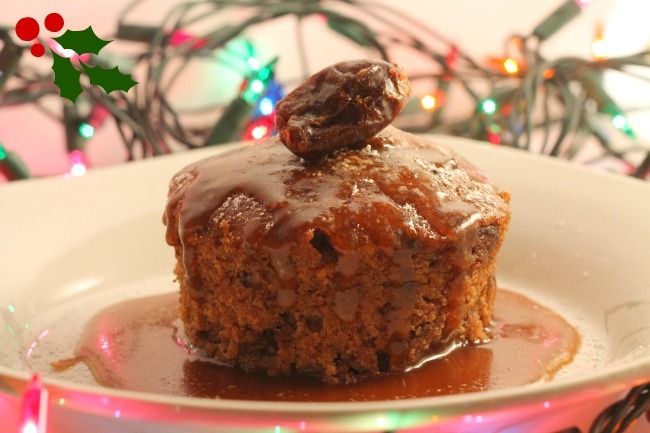 Served still-warm from the oven, smothered in sticky toffee sauce, it’s to die for. A quick sidebar about The Dirty Apron: here in Vancouver, it’s one of our best cooking schools around. I’ve taken classes there, and it was a real treat. They have a gorgeous kitchen, and fantastic instructors. They also have a wonderful little deli where they sell homemade treats, sandwiches, and also gourmet items. The man in charge here is David Robertson. For five years, Robertson was the Chef de Cuisine at Chambar, one of the city’s oldest and most respected modern French restaurants. I think every foodie in the city got a little flutter when they found out that The Dirty Apron was publishing a cookbook. It’s pretty. So, so pretty. Gorgeous photographs. The recipes in this book are not for the beginning cook. Many of the recipes for mains, for example, contain more than a dozen ingredients, and two or three recipes inside recipes. But if you’re someone like me, who as mastered the basics, I think you’ll love this book. I have bookmarked many recipes that I can’t wait to try. This one was the first one I tried, and it is a winner. By the way, my friend Marianne is giving away a copy of The Dirty Apron Cookbook. Head over to her blog to enter. In a small saucepan, bring the dates, water and coffee to a boil over medium-high heat. Cook, stirring often, for 2 minutes. Remove from the heat, stir in the baking soda, then allow to cool for 5 minutes. Meanwhile, beat together, in a separate bowl, the butter, sugar and eggs. Add the baking powder and flour, and beat until well combined. Fold in the date mixture. Butter 4 small ramekins (you could also use a muffin tin), or a larger one if you want to make one big pudding. Preheat oven to 350 degrees. Place the ramekins into a cake pan, and then fill them 1/2 way full. Pull the oven shelf out a bit, and then place the cake pan with the ramekins into your oven. Fill up the cake pan, about halfway, with boiling water, creating a water bath for your ramekins. Bake for 15 minutes at 350, then turn the heat down to 525, and bake for an additional 15 minutes, or until a skewer poked into the middle of the pudding comes out just crumbs. Allow to cool slightly before serving. To make the sticky toffee sauce: melt the butter and brown sugar together in a small saucepan over medium heat. Stir in the cream and the booze, and allow to boil gently until it thickens slightly, about 2 minutes. To serve: unmould the pudding and place it on a plate. Top with a scoop of vanilla ice cream (if desired) and generously pour over the warm sticky toffee sauce. Well, ladies and gentlemen, as mixed as your feelings may be on the subject, the Christmas season is officially upon us, as Christmas is in exactly one month. This time of the year is such a flurry–there are parties, family gatherings, and of course the shopping, cooking and baking. Every single year, I feel like I’m never going to make it with my sanity intact, but yet, here I am, 40-some-odd years in, and still in possession of most of my my marbles. Five years ago, a new Christmas tradition was born in Vancouver. For hundreds of years, European countries (particularly Germany) have celebrated the oncoming holiday season with a Christkindlmarkt, and now Vancouver has its own. Michael and I have been enjoying it as part of our holiday traditions for the last three years. We like to wander around and look at the vendors–toys and crafts–ride the carousel, listen to the live music, and, of course, eat! The Vancouver Christmas Market is now open for the season just outside the Queen Elizabeth Theatre on Georgia St. 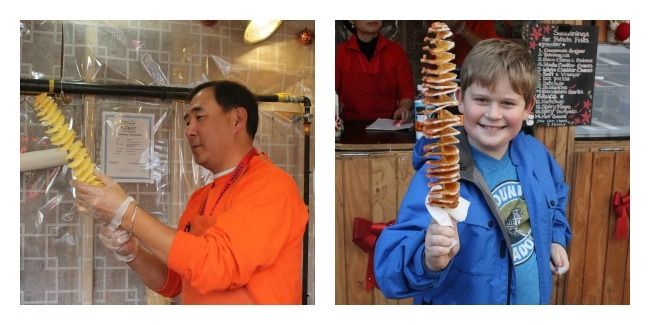 Traditional German Fare: pretzels, bratwurst and schnitzel, oh mein! The Germans traditionally have a pretty meat-heavy diet, and you’ll definitely see that reflected at the market. Bratwurst is a lot like a hot dog, and a schnitzel is a piece of pork that has been pounded thin, then breaded and fried. You’ll also find Haxen, a roasted ham hock that is first salt-cured, then slowly roasted for hours until the meat is falling off the bone. Potatoes also figure heavily into the German diet, and among the potato options you’ll find a potato pancake, which comes served with sour cream and sauerkraut. 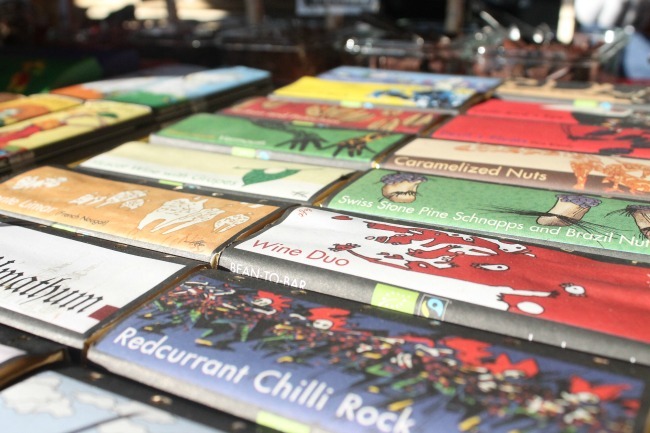 Sweets: there is quite a wide variety of sweets at the market, both to eat there, or to purchase and take home. There are lots of waffle options, of course, and also a poffertjes, which is Dutch mini-pancake made in a cast-iron pan that reminded me of a Takoyaki maker that you see at the Asian Night Market. Both the waffles and the pancakes come with a variety of toppings, including (my fave) bananas and Nutella. 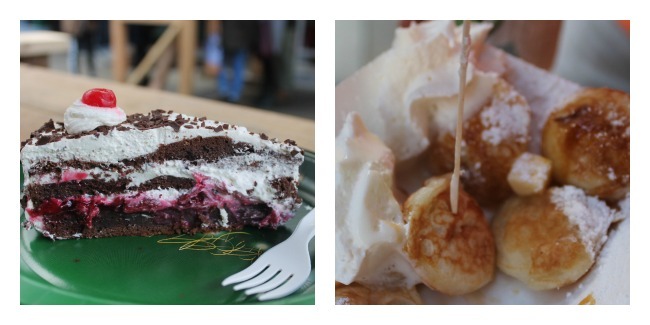 There are also traditional German desserts, like a Black Forest Cake, stollen, gingerbread, and crepes. 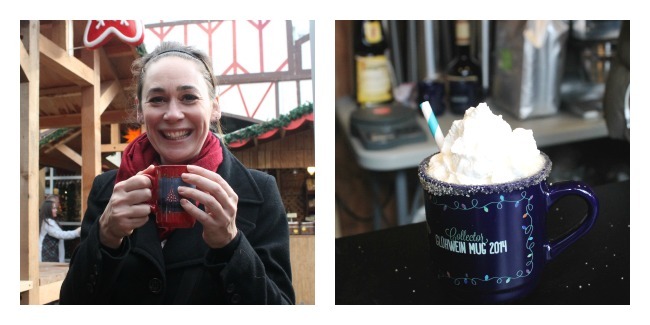 Hot (and boozy) beverages: because it’s an outdoor market, having a warm drink in hand is required. Having it in a warm, steamy mug you can wrap your hands around, and having the addition of liquor are a (wonderful) bonus. The options here include gluhwein (a warm, mulled red wine), hot spiced cider (alcohol free for the kiddies), and boozy hot chocolates and coffees. Things on sticks: c’mon. It’s an outdoor market. That means street food. Street food equals things on sticks! They may not be very German, but Hurricane Potatoes (an entire potato is cut in a spiral, threaded onto a stick, deep fried, and then dipped in seasoning) are a huge hit at the market. There are also waffles on a stick. That’s right. Waffles. Awesome. On a stick? Awesomer. And, although they aren’t on a stick, there are also stick-style pastries, shaped like a long log, similar to a danish, but slightly chewier, and filled with bavarian cream, chocolate, or apples. Vegan options: I was really pleasantly surprised to find vegan options at the Market this year. It’s a surprising fact, but Berlin is one of the top vegan cities in the world, and that’s reflected at the Market this year. Zotter’s Chocolate serves a variety of vegan hot chocolates (made with coconut milk), and there is entire kiosk, Berlin Vegan Eatery, which serves veganized German classics like a grilled cheese made with Daiya and saurkraut, and a vegan bratwurst by Tofurky. If there’s one thing I love about my city, it’s the multiculturalism, and the food options that come with that. Still, it seems like my defaults end up being Thai, Japanese, or Indian food when I’m eating out, and almost never German. 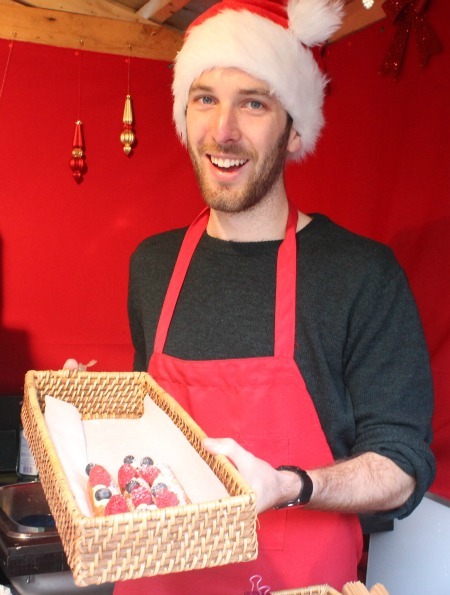 So visiting the Christmas Market is a great opportunity to try something new.